There are two Irish interests in this year's Kentucky Derby. 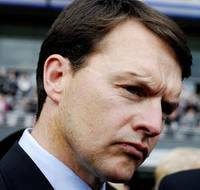 Master of Hounds is trained by resident Irish genius Aidan O'Brien, pictured, in Ireland and is being shipped across the Atlantic for the race. The other Irish interest is Santiva, trained by Waterford-born Eddie Kenneally who now works out of Kentucky. Santiva was favorite for the recent Blue Grass stakes, a key Kentucky Derby prep but ran disappointingly. Master of Hounds is intriguing, even more so because top American jock Garret Gomez will be on board. O'Brien has shipped into the Kentucky Derby before but with little success, but may have a stronger hand this year. That is because Master of Hounds has run on a surface not too dissimilar to dirt when he placed second just beaten a nose in the United Arab Emirates Derby in Dubai. Most European horses have no experience other than o grass so Master of hounds is a better known quantity. He is also said to have suffered bleeding in races so the fact that he can be injected with lasix, the anti-bleeding medication in Kentucky means he may have a real shot. Santiva on his best day could also surprise. he has a crucial win over the Churchill Downs dirt as a two-year-old and if he were to run back to that form could be in with a real shot in a wide open derby. Aidan O'Brien is trying to do the impossible by wining the Kentucky Derby after just one prep prace and shipping in from Ireland. But O'Brien has often defied the odds in his spectacular career and he just might do so again on Saturday.